It's time once more to peek into the jewel collection of our magpie of the month, everybody! I've saved one of the most intriguing pieces from Princess Louise's jewels for last: her diamond floral tiara, composed of several diamond elements -- and possibly seen in recent years on a popular television drama. The tiara, seen above, is actually composed of multiple pieces of jewelry cobbled together. It includes a diamond floral spray and a series of floral brooches, including daisies and forget-me-nots. The pieces were all from among Louise's wedding gifts, though there are conflicting reports about the identity of the giver. Ursula identifies two parties who gave the princess diamond floral garlands and/or floral brooches: Lord Farquhar, the best man at the wedding, and the Sassoon family. She suggests that the tiara may be composed of parts from both gifts . Louise was photographed in the tiara in 1905, standing alongside her mother, Queen Alexandra, and her sister, Princess Victoria. It's the best portrait that exists of Louise wearing the tiara, and to my knowledge, she wasn't pictured in the tiara again after that occasion. Exactly what happened to the tiara is something of a mystery -- the pieces were likely inherited by one of her daughters, Alexandra or Maud; some of the jewels that they received from their mother were later sold at auction. In 2012, a new theory emerged about this tiara's fate. That year, Lady Mary Crawley, one of the main characters in Downton Abbey, the famous ITV period drama, wore a diamond floral spray tiara in her wedding on the show. That tiara was borrowed by the production company from Bentley & Skinner, a London-based firm that acquires and sells antique jewels. They describe Lady Mary's wedding tiara as an "important Georgian diamond tiara, the tiara in the form of a garland spray of leaves and floral clusters, pave-set throughout with old-cut diamonds, weighing an estimated total of 45 carats, cutdown collet-set in silver to a yellow gold mount, convertible to two brooches, gross weight 75.5 grams on frame, circa 1800" . 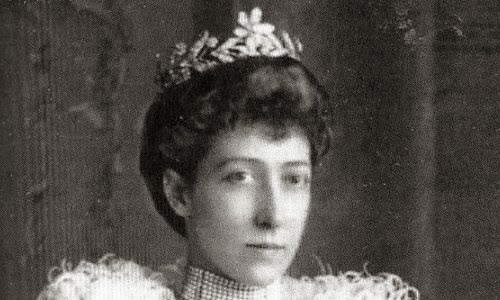 The tiara currently owned by Bentley & Skinner is not linked by the firm to the diamond spray worn by Princess Louise. However, an article in the Daily Mail claims that the two are indeed the same piece. They call it the "myrtle tiara" and note that it was a gift from the Sassoons to the princess; they also note that it can be dismantled and worn as a set of brooches, "which Princess Louise often did" . The Mail article doesn't give sources for the information, though as the piece involves its writer, Petronella Wyatt, trying on the tiara under the watchful gaze of a public relations rep from Bentley & Skinner, it seems plausible that they may have shared the information with the paper. Other jewel watchers aren't sure about the connection; posters at the Royal Jewels of the World forum have examined the two pieces and decided that there are significant differences between the two . I think it's also plausible, though, that as Louise received diamond floral sprays from two different guests at her wedding, she may be wearing one spray (possibly the one given to her by Farquhar) in the 1905 photo, while the second, slightly different piece is now owned by Bentley & Skinner (and available for you to rent out for a mere £1,750 a day -- plus a £126,000 deposit! ). It's tough to say for certain, but I am sort of glad that a piece that was perhaps formerly worn by royalty is still accessible to the public today -- even if it's only on television on Sunday evenings. 2. See more, including additional photos, at Ursula's website. 3. The Bentley & Skinner page on the tiara, including a set of photos, can be seen here. 4. You can read the full piece on the tiara from the Mail on their website. 5. Here's the relevant thread from the message board. 6. Here are the details, again from the Mail.